Zone3 got together with 6x World Record holder Mark Foster to design swimwear that was as much about performance as it was style and comfort. The MF-X Aquashort comes in a slightly shorter cut than the full-length MF-X Jammers but ensures the same great fit without the extra material. The shorts have been made with built-in compression which helps to reduce fatigue by returning blood back to the heart faster and more efficiently as well as improving hydrodynamics. These shorts are also 100% chlorine proof meaning they have great longevity for as many fast swims as you can put yourself through. The MF-Xfinity range is made from a combination of fabrics to ensure low water retention, durability and coverage. The main fabric is called XFINITY which is 100% chlorine proof and exclusively made in Italy. This fabric is very long lasting, has fantastic shape retention, is breathable, fast drying and offers UV protective (UPF 50+). The low profile Aqua short offers a mid-thigh length and is designed to offer support, comfort and a full range of movement. Discrete flatlock seams provide great shape with a seamless appearance and an inner drawstring waist cord makes sure of a secure fit. 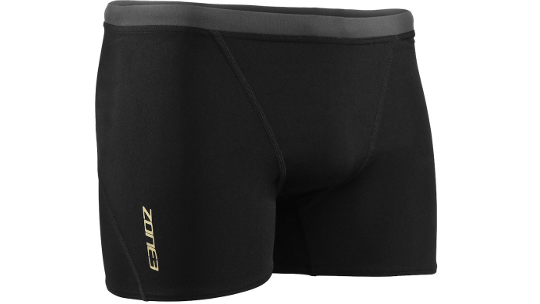 An extra inner lining is built into the front crotch to offer support and coverage. The short features a stylish Gold wave pattern design printed on the left side with a mix of embroidered and printed logos, including the all-important MF-X mark of approval.